In 2016, I created a metric I call “Actual Opportunity”. You can read the in-depth explanation here. Using a 10-season sample of play-by-play data we can calculate expected fantasy points from a player’s seasonal or weekly usage. 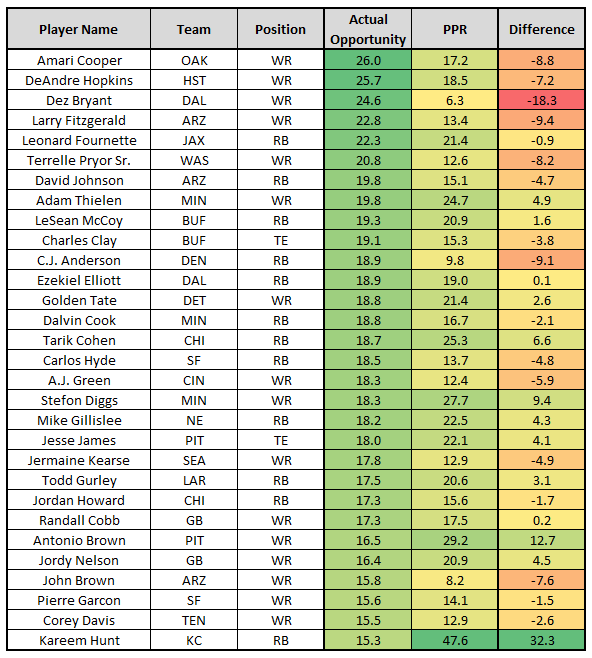 We look at each target (by depth of target and distance from end zone) and each carry (by down and distance and distance from the end zone) and add this up to determine how valuable a player’s role was for fantasy purposes. We can contrast this with fantasy production to measure efficiency. In layman’s terms, Actual Opportunity is “how many points a player should have scored” given his workload. Since we have only one week of data, this keeps things simple for today’s article. Hunt exploded for 246 total yards and three scores in his NFL debut against the New England Patriots, who allowed the ninth-fewest fantasy points per game to opposing running backs last season. He ranked first in fantasy points, but just 12th in Actual Opportunity points at the position. He again has a tough matchup this week against a fearsome Philadelphia defensive line that allowed just 34 yards rushing and combined for four sacks and 19 pressures in Week 1. Philadelphia matches up especially well against tight ends, allowing the second-fewest points to the position last year. This fearsome pass rush may mean more short passes to the running backs. Hunt fared especially well in this capacity last season (ninth-best in yards per route run in 2016 at Toledo) and on Thursday catching all five targets for 98 yards and two scores. Though Charcandrick West saw only one target, he ran just one fewer route than Hunt on Thursday. If this split doesn’t shift closer to Hunt’s favor in Week 2 (it should), it will put a significant damper on his ceiling. As it stands, he’s a weekly must-start and still a strong DFS play this week.